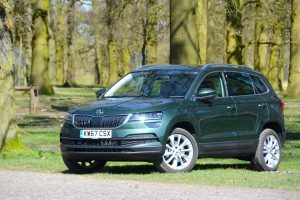 The Skoda Karoq is a compact SUV – the type of car that everyone wants – and it’s good to drive, efficient, practical, and affordable. 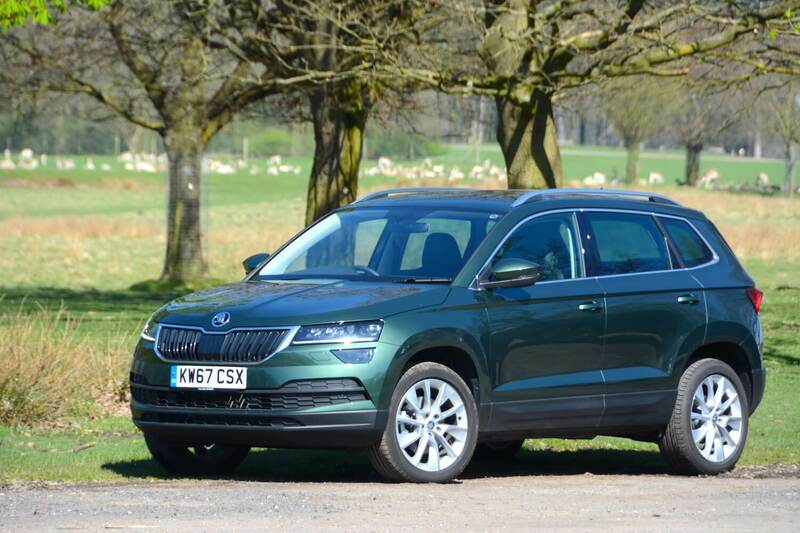 The Skoda Karoq sits in the increasingly busy compact SUV sector – the fastest-growing area of the new car market, and now the second biggest sector in the UK. 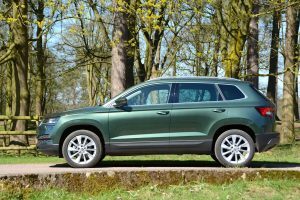 It effectively replaces the Skoda Yeti, although it’s bigger than the Yeti, and it shares a platform with the Volkswagen Tiguan and SEAT Ateca. 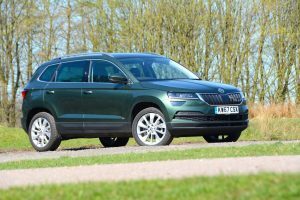 So should you choose the Skoda Karoq over the Tiguan, the Ateca, or any of the other rivals in this sector? 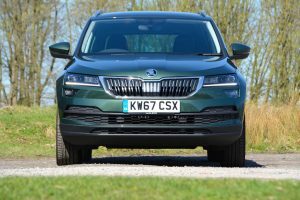 The Karoq on test had a 150PS 1.5-litre TSI petrol engine, a six-speed manual transmission and front-wheel drive. This engine has Active Cylinder Technology (ACT), meaning that two cylinders can be deactivated when not needed in order to save fuel. 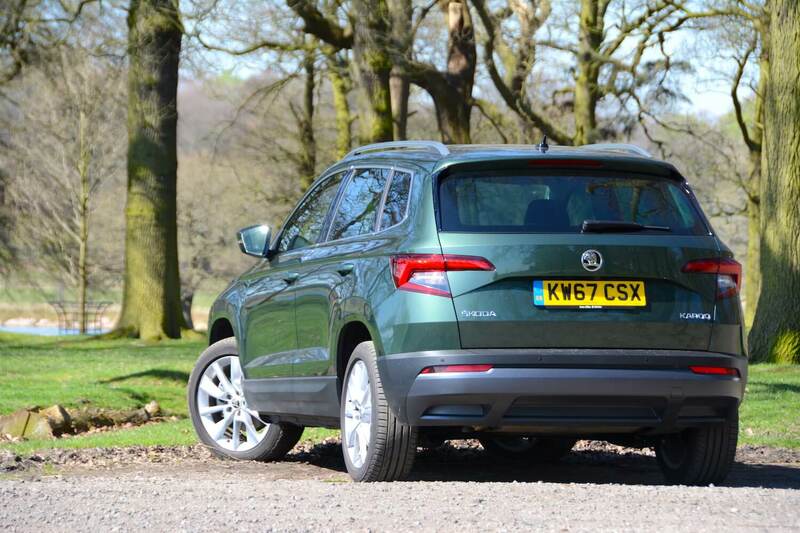 We think that the Karok looks good, especially in the Emerald Green metallic paint colour of our test car. The interior is also practical, with a functional dashboard and Skoda’s Varioflex seating system which consists of three separate rear seats that can be individually adjusted – such as to make more space in the boot (which is a decent size anyway) or to increase legroom for rear seat passengers – or they can be completely removed. 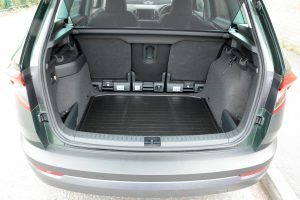 There are lots of storage compartments, as well as features such as folding tables on the back of the front seats and a front central armrest that can move forwards or backwards. 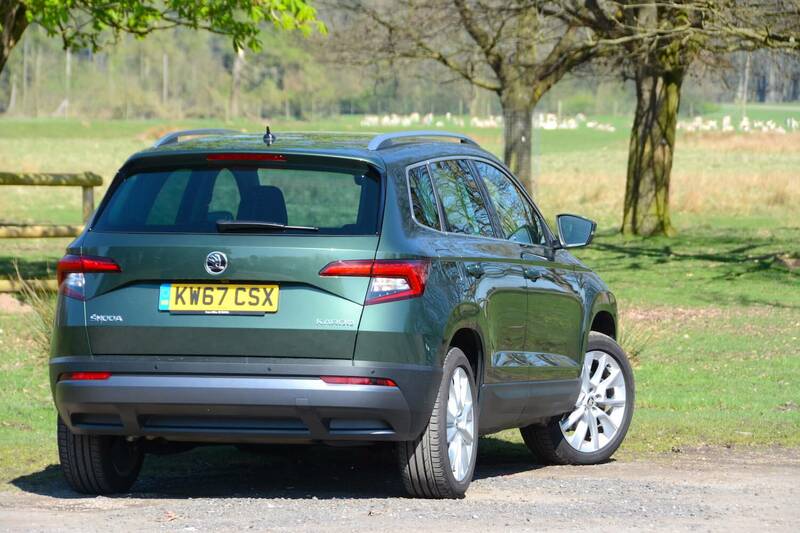 The Karoq feels light and agile to drive, with good handling and a decent ride. The 1.5-litre petrol engine moves the 1378kg vehicle around effectively (although there’s some turbo lag) and it’s mostly quietly (but there’s some wind noise on the motorway). 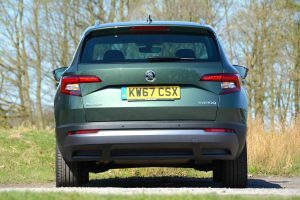 However the gearbox can be notchy, and the clutch action isn’t particularly slick. There are four driving modes: Normal, Eco, Sport and Individual (and ‘Off-road’ for 4×4 models). We had a few issues with the satnav, which sometimes warned about ‘obstructions’ on the route but didn’t accurately predict traffic jams, offer diversions, or adjust arrival times due to delays. 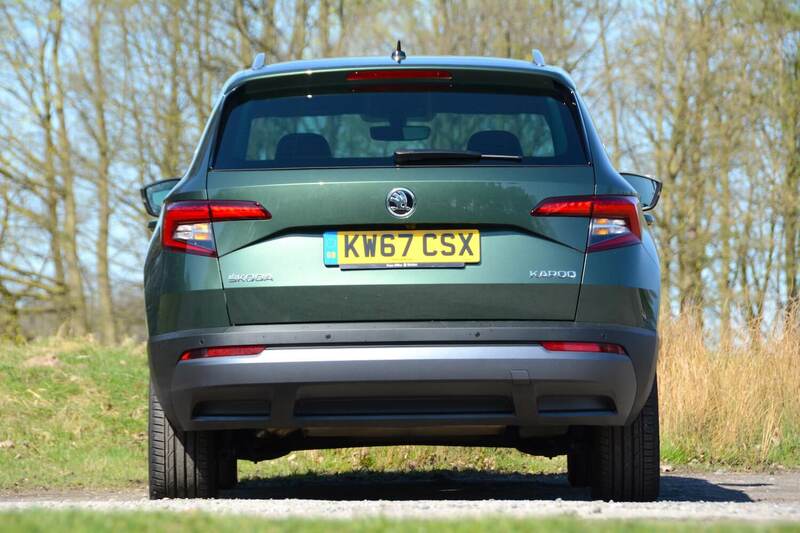 The Karoq came with a reversing camera which is always a useful feature, especially for cars that may be regularly used for duties such as the school run. 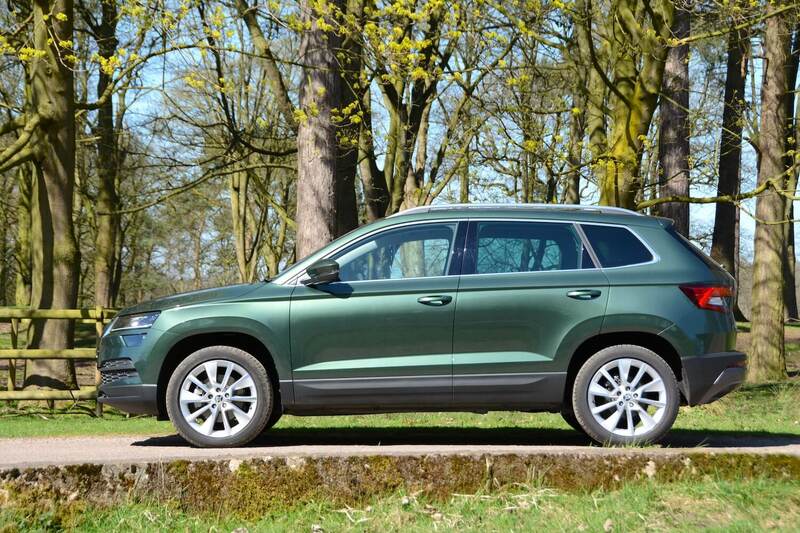 The official NEDC combined fuel economy for the Skoda Karoq 1.5 TSI 150PS SE L is 51.4mpg, with CO2 emissions of 125 g/km. We achieved 65mpg at 50mph on the motorway, but this dropped to 35mpg or below around town. Overall after a week of mixed driving we averaged 42.1mpg, which is respectable for a petrol SUV, albeit a compact one. The cylinder deactivation technology no doubt helped with economy when our driving involved lots of coasting. 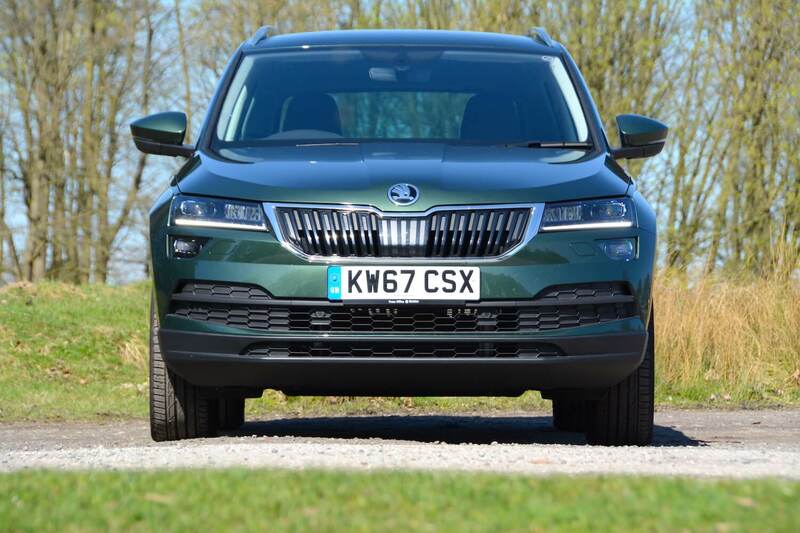 The Karoq has a useful real-world driving range of around 400 miles. The Skoda Karoq 1.5 TSI 150PS SE L costs £24,520 – making it decent value. Options fitted to our test car included family pack (£120), heated windscreen & washer nozzles (£250), ISOFIX on front passenger seat (£35), metallic paint (£575), steel space-saving spare wheel (£150), taking the total price to £25,650. 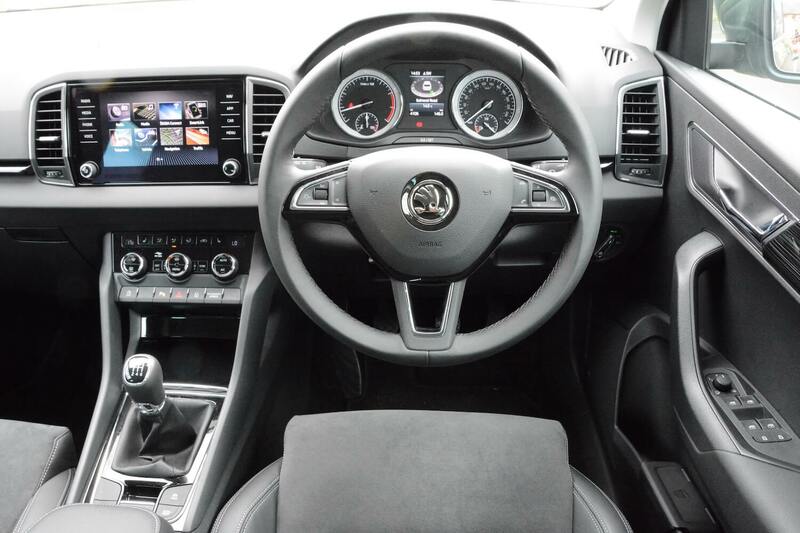 There are four engine options: two TSI petrol units with outputs of 115PS and 150 PS, and two TDI diesels – also with power outputs of 115PS and 150PS. All four are available with a seven-speed DSG transmission as an option, and the most powerful diesel model – the 2.0 TDI 150PS – comes with four-wheel drive as standard. There are four trim levels: SE, SE L and Edition, and the fleet-focused SE Technology. 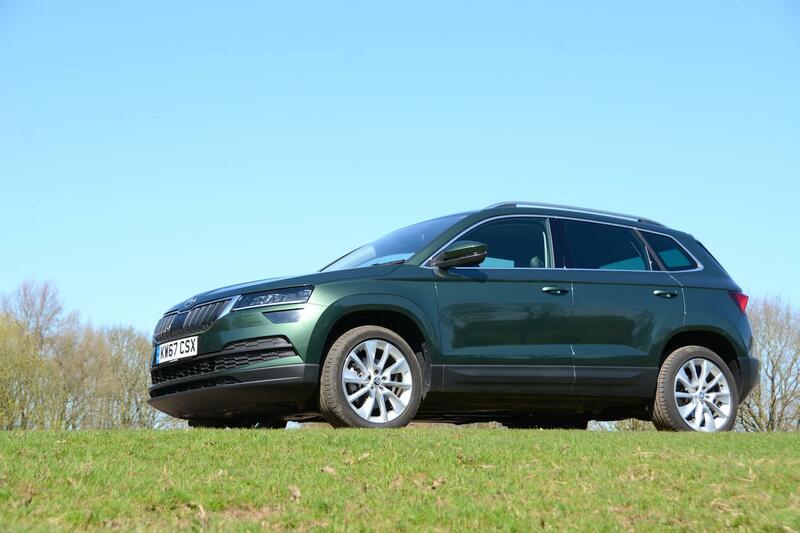 The best-selling Karoq model in the UK is expected to be the SE model fitted with the 1.5 TSI 150PS engine. There are a lot of compact SUVs out there, so how do you choose the right one for you? 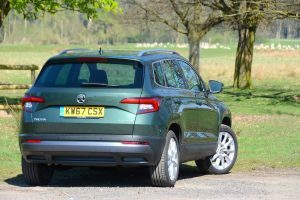 Well, the Skoda Karoq is a very competent all-rounder. It’s good to drive, it can be efficient, and it’s decent value. 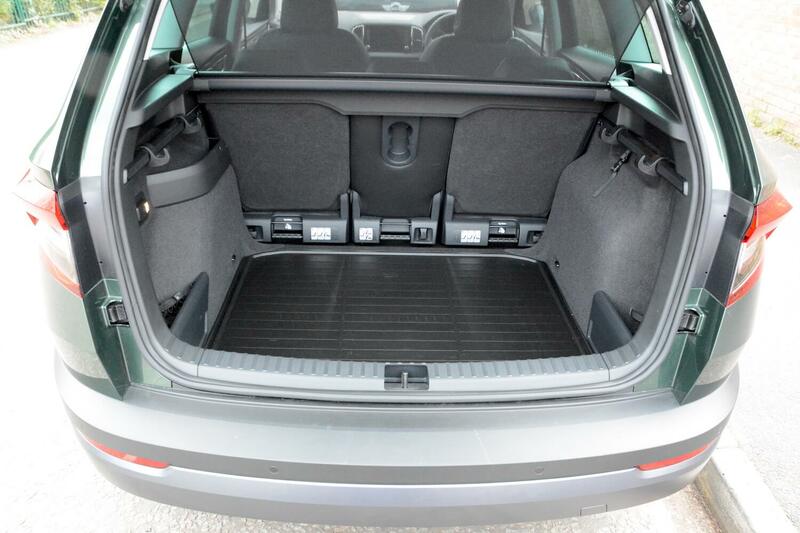 It’s also practical, with the Varioflex seating system genuinely helping in this area, giving either a large boot, or good legroom for rear seat occupants. 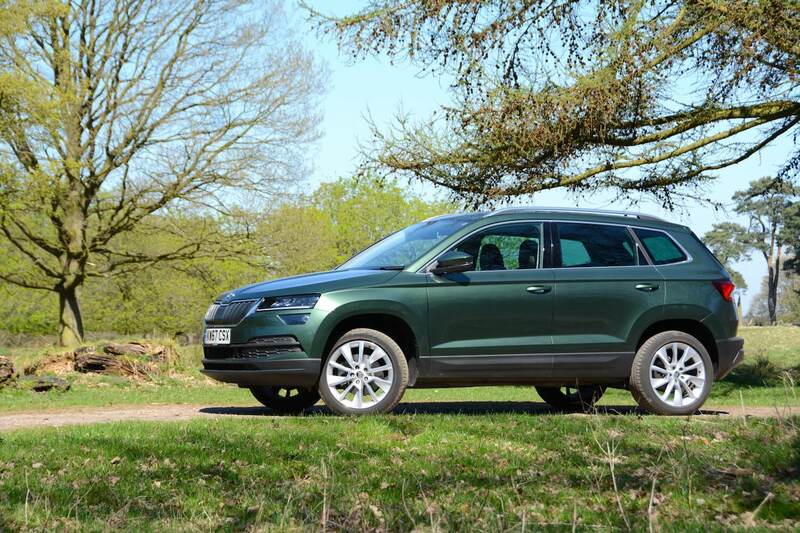 We generally recommend that if you’re buying an SUV then you may as well buy one with all-wheel drive, as we can’t see the point of buying a car with all the potential of all-wheel drive – then having this capability ‘disconnected’; you may as well buy an MPV instead. 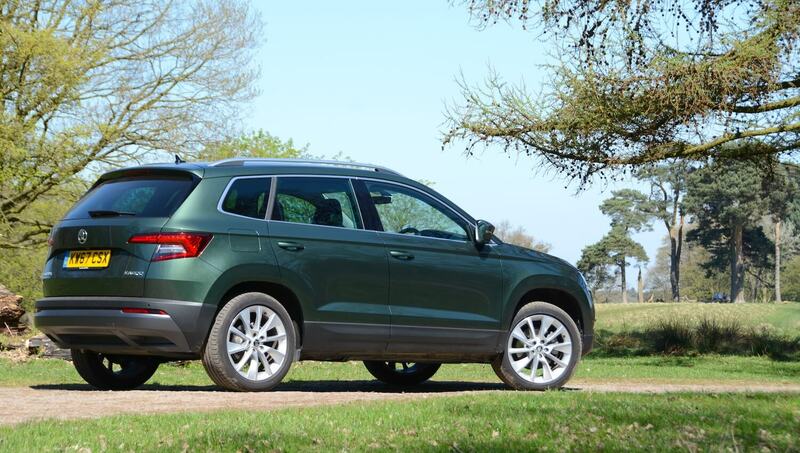 SUVs also suffer from all the efficiency implications of this body style such as poor aerodynamics and extra weight. 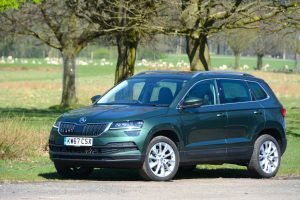 We’d still recommend the 4×4 version of the Karoq for this reason, but most current small/medium-sized SUVs from the Volkswagen Group are just giving car buyers what they want – the height of the driving position, the practicality of the boy style, and the image that an SUV provides. And the Skoda Karoq 1.5 TSI 150PS SE L does a good job of delivering these things, even in front-wheel drive form; it gains a Green Car Guide rating of 8 out of 10.